Pay each time you receive a booking and avoid surprise fees. Set your prices either by net amount (your payout) or gross amount (price to guest) and we’ll guarantee your payout. No more checking separate accounts with different payout policies. No more dealing with dozens of different companies and fees. Our 15% booking fee covers all services and costs below to simplify your business. All website commissions and fees are included. Bank commissions for processing your payout are included. Refunds, changed payments and processing commissions are included. Multi-lingual support for your guests while booking is included. Choose the plan to suit your needs. We issue your payout 24 hours after the guest checks in to your nominated bank account. Want payout before check-in? Check out the plans below. Want to understand how our pricing works in practice? 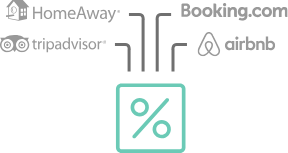 Enter your rates in our Pricing Simulator, and we’ll show you our calculations. Simply enter your payout amount to calculate our price to guest, or your price to guest to calculate your payout amount. Cleaning fees are paid out in full with no fees applied! Sign Up Free and get access to Your.Rentals today.